← CHINA: Hu denies forced abortions! 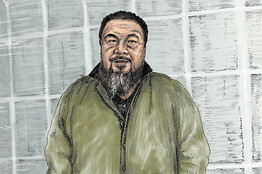 Beijing, He may not be China’s most famous living artist, but Ai Weiwei’s stature defies all odds: He not only delights in infuriating Chinese officials, but this soft-spoken, multitalented artist, known best for his performance and conceptual work, also eschews cocktail parties and claims to spend a mere 5% of his time thinking about or creating art. Mr. Ai himself doesn’t smile much. Mr. Ai spends six to eight hours each day online, largely on Twitter. His blog was blocked long ago. When Mr. Ai was placed under house arrest last November, news immediately spread around the world. All this would seem to leave Mr. Ai scant time for making art; instead, it’s fueled a prolific and meteoric career. He mounted more than a dozen shows last year, including an exhibit at London’s Tate Modern (through May 2, 2011) that features 100 million porcelain sunflower seeds, individually crafted by 1,600 workers. Mr. Ai is also among China’s most well-known architects and photographers. He has two major shows soon: a retrospective in Switzerland of his photography and an exhibition in Austria of his architecture. That he can achieve all this without much time for meetings or networking is all the more astonishing since such work normally demands total immersion and constant self-promotion. Of course, it helps that the Chinese government buoys Mr. Ai’s fame by keeping him in the news. At the time of our meeting, Mr. Ai was again making headlines. He had just returned from Shanghai, where on Jan. 11 he watched as authorities demolished his studio there. It was part of a $1 million artistic community center that local officials had asked him to build, hoping Mr. Ai’s presence would anchor a new arts district like Beijing’s 798 (which he had helped found). The plan worked: With Mr. Ai on board, other artists flocked to the new area. But the welcome mat was soon yanked from under him, Mr. Ai maintains, because of his social advocacy. Officials had hoped to quietly raze the Shanghai center. When they first told Mr. Ai last year that they planned to tear down the building, he mischievously promised a huge farewell party featuring river crab—which in Mandarin sounds like the term for harmony, the ideological buzzword of the Communist Party. This outraged officials and resulted in Mr. Ai’s November confinement at his Beijing home, guaranteeing that word would spread throughout the Internet. “It’s so predictable,” he says, almost sympathetically. China is used to shocking stuff from this bold artist. He’s spent years fighting for a full accounting of student deaths from the 2008 earthquake in Sichuan. One of his most powerful works fills a studio wall with the names of 5,000 children. They were in the 20 schools that turned to dust while the surrounding buildings stood firm, he notes. Officials still refuse to investigate the apparent corruption that resulted in such substandard construction or to acknowledge such a large number of deaths. Instead, they respond with repression and arrests. Several advocates have been detained. When local writer and activist Tan Zuoren went on trial, Mr. Ai flew to the provincial capital of Chengdu but was prevented from attending. “Police beat me, and I nearly died,” he says. In Germany for a subsequent art exhibit and suffering from headaches, he saw a doctor and was rushed into surgery to drain blood from his brain. Critics suggest that Mr. Ai uses advocacy to further his career, and hides behind the security of a foreign passport. “I’m here on a Chinese passport, like everyone else,” he responds. While he spent a dozen years in New York, his was a textbook story of the struggling artist. He snapped the odd picture for newspapers, but mostly survived as a day laborer, often demolishing buildings. To escape the parental nagging, he fled to the outskirts of Beijing, to a bleak village called Caochangdi. It’s now one of Asia’s chic artist colonies, along with nearby 798. Mr. Ai reckons he’s responsible for the design of perhaps 100 units around Caochangdi. Other artists began hankering for similar spaces, and many found them in the abandoned warehouses at 798. Celebrated internationally, Mr. Ai has largely escaped a backlash against his activism. Until now. Days before we met, his first major exhibit at 798 was abruptly canceled. Yet there is little chance he will back down. Perhaps unapparent earlier to his parents, his veins are unquestionably filled with the blood of his father, an artist and celebrated poet exiled to a labor camp during Mao’s purges. Ai Weiwei grew up in China’s desolate Xinjiang province, watching his father clean toilets. “I want to have a purpose, to protect the dignity of life. I feel it’s ridiculous to live in a condition where people cannot access their rights. I don’t want children to live in this situation. He acknowledges that his fame, and friends around the world, afford him that ability. Mr. Gluckman is a writer based in Beijing. This entry was posted in China, Human Rights. Bookmark the permalink.